Claudio was born and raised in the province of Mendoza, Argentina – where he also completed his BA in Communication at Universidad Nacional de Cuyo. He holds a Ph.D. in Anthropology from the University of Alberta. He was a Postdoctoral Fellow at Université Laval, and a faculty member in the Department of Sociology and Anthropology at Carleton University, before moving to Dalhousie in 2013. He held the Canada-US Fulbright Chair at the University of Washington in 2012. View Claudio's Research Gate Profile. 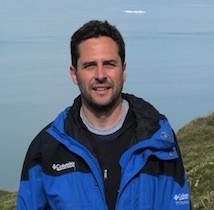 Claudio has done ethnographic research in the Canadian Arctic since 1998. He has documented Inuit knowledge and use of marine and coastal areas in the Eastern Canadian Arctic and in Nunavik. Claudio’s research has also focused on the geographic representation of indigenous environmental knowledge. His projects have been funded by Wenner-Gren, SSHRC, NSERC, National Geographic Society, Canada Foundation for Innovation, Levrhulme Trust, the Government of Nunavut, and a number of indigenous organizations. He is also a faculty member of the Geomatics and Cartographic Research Centre at Carleton University, and the current director of Dalhousie University’s Esri GIS Centre of Excellence for Higher Education. Some outcomes of Claudio’s work include the creation of digital atlases (see http://paninuittrails.org, and http://sikuatlas.ca/index.html). His current interests are connected to co-management, sustainable communities, Marine Spatial Planning, indigenous and local coastal knowledge, and knowledge mobilization. CRASSH Visiting Fellowship, Centre for Research in the Arts, Social Sciences and Humanities, University of Cambridge, UK. Claire Hall Visiting Scholar Fellowship, University of Cambridge, UK. Knowing Our Ice, Documenting Inuit Sea Ice Knowledge and Use. Krupnik, I., Aporta, C., Gearheard, S., Laidler, G. J. and Kielsen-Holm, L. Siku:, Netherlands, Springer (501 pages) (2010). Inuit Geographies of Sea Ice. Aporta, C., Taylor, F., Laidler, G. Special issue of The Canadian Geographer, 55(1) (2011). The Power of Maps: ILUOP (1976) as a Landmark in Inuit Land Use Studies, in Krupnik, I. (editor) Early Inuit Studies: Themes and Transitions, 1850s-1980s (Smithsonian Institution Scholarly Press), pp. 354-373 (2016). “From Inuit wayfinding to the Google World: Living within an ecology of technologies,” in Miggelbrink, J., Habeck, J., Mazzullo, N., and Koch, P. (eds) Nomadic and Indigenous Spaces: Productions and Cognitions. Ashgate, Farnham (2013). The sea, the land, the coast and the winds: Understanding Inuit sea ice use in Context in Krupnik, I., Aporta, C., Gearheard, S., Laidler, G. J., and Kielsen-Holm, L. Siku: Knowing Our Ice, Documenting Inuit Sea Ice Knowledge and Use, Netherlands, Springer (pp. 165-182) (2010). Life on the ice. In: Main Johnson, Leslie, and Hunn, E. (ed.) Landscape Ethnoecology: Concepts of Biotic and Physical Space, Berghahn Books, New York, pp. 175-199 (2010). SIKU: International Polar Year, #166 (An Overview). Krupnik, I., Aporta, C. and Laidler, G. J. (2010) in Krupnik, I., Aporta, C., Gearheard, S., Laidler, G. and Kielsen-Holm, L. Siku: Knowing Our Ice, Documenting Inuit Sea Ice Knowledge and Use, Netherlands, Springer (pp1-29). Picturing Pikialasorsuaq: Ethics & Effectiveness of Representing Inuit Knowledge in an Online Atlas. Tesar, C., Egede Dahl, P. & Aporta, C. 2019. The Journal of Ocean Technology 14 (1): 12-22 (2019). Shifting perspectives on shifting ice: Documenting and representing Inuit use of the sea ice. The Canadian Geographer, 55(1): 6-19 (2011). The Igliniit Project: Inuit hunters document life on the trail to map and monitor Arctic change. Gearheard, S., Aporta, C., Aipellee, G., and O’Keefe, K. ‘’ The Canadian Geographer, 55(1): 42-55 (2011). The Trail as Home: Inuit and Their Pan-Arctic Network of Routes. Human Ecology April 2009: Volume 37: 131–146; DOI 10.1007/s10745-009-9213-x (2009). From map to horizons; from trail to journey: The challenges of documenting Inuit geographic knowledge. Études Inuit Studies, Volume 29 nos 1-2 (2005): 221-23. Routes, trails and tracks: trail-breaking among the Inuit of Igloolik,” Études Inuit Studies (vol. 28(2), December 2004): 9-38 (2004). Using GPS mapping software to map Inuit place names and trails,” Arctic Vol. 56, No. 4: 321-327 (2003). Life on the ice: Understanding the codes of a changing environment.” Polar Record 38 (207): 341-354 (2002).